Another story where everything goes wrong for Bill Paxton. This is a movie I've liked for a while, but I just read the book this weekend and was reminded how good it is. I'd really recommend it if you enjoy the movie. I caught this on TV one night years ago and it's one of those movies that has stayed with me. Such a grim, compelling movie. "Did you see them birds?" Haven't seen this in a long time, but I should re-watch. When I saw it in the theater I remember being incredibly tense when Gary Cole shows up, through the confrontation by the plane. Billy Bob Thornton is fantastic in it...Just incredibly funny and sad. And it's Paxton's best performance in a movie, I think. His acting in the scene late at night sitting in the kitchen when Thornton explains their father's death to him has stuck with me pretty hard. Speaking of that scene, I love how throughout the movie Thornton (the "dumb" one) is so much more aware and makes better decisions than Paxton. The Whelk, that is an amazing analysis. I haven't seen the film in years, but as the author talks about, I definitely saw Hank as the sympathetic protagonist, undone by temptation and circumstance. Now I'm realizing how false that is! I need to rewatch this. Actually, it's funny, because I've always reflexively grouped this movie together in my mind with Election. Which is another movie that came out in the late 90s about a middle-class guy in a small midwestern town who seems to have an idyllic All-American life in the beginning (sweet wife, new baby, cute little house, modest but professional job). And with both, on first viewing it's really easy to see them as "sympathetic protagonists, undone by temptation and circumstance." But on further reflection, they are both actually the villains of their stories. And neither is a helpless victim of things spiralling out of control - they are both undone because of terrible decisions they've made and horrible things they've done to other people. I just watched this last month, after seeing it listed on Letterboxd in "Recommended 1990s Crime". I loved it, and have never been so impressed by Bridget Fonda as I was by her Lady Macbeth-in-a-nursing-bra turn. It's so good, and so chilly. One of my favorites! 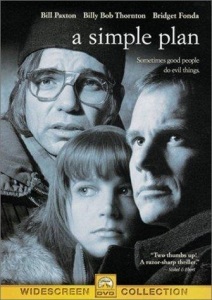 Bridget Fonda is terrific and Billy Bob Thornton does an amazing job. The story shows the danger pulling these people in like a black hole. Strongly seconding the plug for The Whelk's link above, which I came here to recommend. I'm a person who has a hard time watching movies where the protagonists make bad decisions and this movie is one of the most grueling I've ever watched. It's really well done, emotionally powerful, and highly memorable but I don't think I could ever watch it again. Yeah. In that way I associate this movie with "Affliction, " which I see came out just a month after this one.